Not bad for only twenty minutes of work. Yes, eating this would be work. 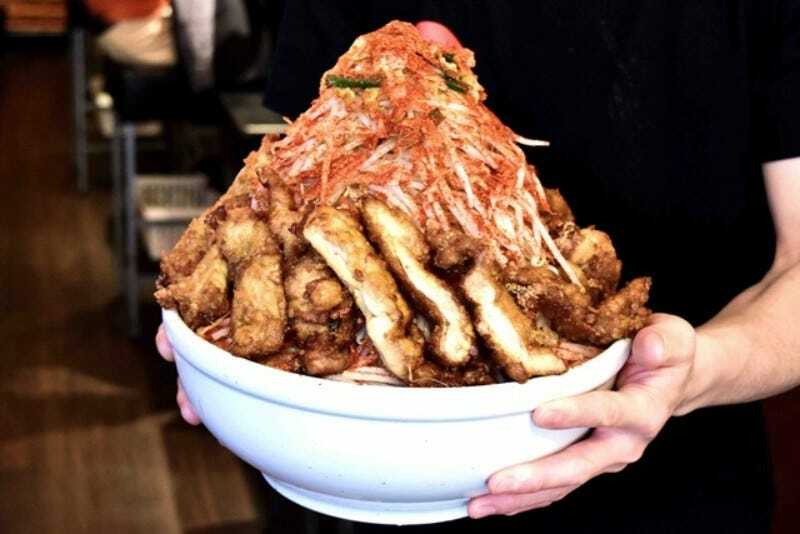 Tokyo ramen restaurant Umakara Ramen Hyouri has “mega serving” challenge: If you eat this whole bowl of ramen in under 20 minutes, they’ll pay you 50,000 yen (US$438). Do it in 30 minutes, and they’ll give you 30,000 yen ($263). Japanese website My Navi went to check out the challenge. To enter, you need to pay 3,000 yen ($26). There are a whole host of rules, such as no help from friends. Also, if you barf up the ramen after you finish eating, you must cough up a 10,000 yen ($88) penalty. That’s four servings of ramen noodles in that bowl, 8.8 pounds of bean sprouts, and nearly 24 ounces of broth. See that red powder? That’s chilli powder. If finishing this seems like an impossibility, it’s not. According to My Navi, in the past three years that this restaurant has offered the mega serving challenge, nine heroes have been successful. Many more have not.